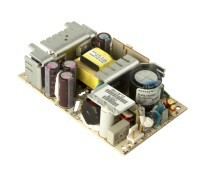 The NLP65 series is a 65 W universal input AC/DC power supply on a 5 x 3 inch card with a maximum component height of 1.26 inches for use in 1U applications. Each model has the option of input harmonic current correction in the same package size making the series ideal for product designs that will need to comply with EN61000-3-2 legislation. The NLP65 provides 65W of output power with free air convection cooling which can be boosted to 75W with 20CFM of air. The NLP65, with full international safety approval and the CE mark, meets conducted emissions EN55022 level B and has immunity compliance to EN61000-4-2,-3,-4, -5, -6. The series is available in a factory installed enclosure with an IEC connector and output connector on flying leads plus a cover kit for self-installation is also available as an accessory. The NLP65 series is designed for use in low power data networking, computer and telecom applications such as hubs, routers, POS terminals, internet servers, cable modems and PABX’s. Size (L x W x H):5.000" x 3.000" x 1.300"